All that turkey and tryptophan made the Power Rankings late this week. Well maybe that’s the reason… and maybe it is just coming to the realities of the injuries plaguing the NFL and what appears to be specific strategy by the powers that be to take down America’s team and their AFC sister. That’s right… I’m going to go ahead and say it. Goddell is conspiring against the Cowboys and the Patriots. With that said… We’ve fired Larry Culpepper and gone back to the original algorithm designed by Gary Plonderson. Patriots– Some are going to be shocked by the Patriots still being in the #1 spot, but I’m not. An overtime loss in Denver with depleted troops doesn’t derail their overall skill and prognosis of being NFL champs again. Cardinals – A large dropoff from 2 to 3 and yes the Cardinals barely survived against an awful 49ers team but that is what teams like this do… just enough to get the win. Seahawks – Even without Beast Mode, the Seahawks won a tough matchup with Pittsburgh. Mark it down, the Seahawks are poised to make a run. Bengals – Moving up a spot because of their dominating win last week. The Bengals will have gotten better because of their two losses – but they still have the Red Rider at the helm of the offense and thats going to cause an issue when the playoffs come around. Sorry Not Sorry. Broncos – Big win last week to knock off the Patriots but Osweiler isn’t the next coming of Peyton Manning. The defense will only take them so far. But a second round playoff matchup with the Bengals in the playoffs could be a dandy. Packers – What? The Packers got beat on Thanksgiving but hang on to their #7 spot for now but it is precarious at best. They still have the talent and can put it together easily to get back to the top of the NFC. Bears – Moving up another spot. People took them as a joke at #9 last week. Who is laughing now? A big win at Green Bay last week makes you wonder how good they could be if they didn’t have Cutler as their QB. Bengal fans laugh at the Bears QB. Vikings – Back in the top 10 after a solid win against an Atlanta team that used to be something. Remember that? What a precipitous drop. The problem with the Vikings though is that teams are going to stack the box against Pederson and make them throw. And that is a problem. Cowboys – When Romo’s collarbone sustained another collarbone injury, the season vanished like Volkswagen’s market share. Patriots– Injuries be damned, they just go ahead and keep winning. Ol’ Rex did his best but despite that and inadvertent whistles, the Pats are still the Pats. With Denver on the horizon and injuries aplenty it could be a tough week for the Pats. Panthers – And just like that they close the gap on the Pats. That said they have a Thanksgiving matchup of epic proportions. It’s not often that we get a Turkey burner with two top 5 Power Ranking teams. Cardinals – A tough hard fought win but the fact the Cards could pull off a big win despite a very rough start says a lot for this overlooked team. Cowboys – With Romo back, the Cowboys brought back the swagger and improved to 3-0 with Tony. Despite the inexplicable 7 game losing streak, the Boys are in a near-must win against the undefeated Panthers. Seahawks – Beast mode is down for a bit and that’ll hurt the Hawks but they are legit all around and are putting the pieces together. Pete Carroll knows some things are worth waiting for and the rest of the NFL doesn’t want to know that. Bengals – The Bengals two game skid shouldn’t be overlooked but at the same time they almost pulled off a win in Arizona. They are good… but are they great? Time will tell. Packers – The Packers came back to life after a death roll spiral that seemed out of control. Rodgers looked strong and the two-headed running back system seemed to pay dividends in a big win against Minnesota’s tough defense. Broncos – Brock Osweiler you say huh? How many people would have been able to name Peyton’s backup just a couple weeks ago? Yet now, there seems to be hope in the mile high and that gives Peyton time to heal … maybe. Bears – A tough loss against Denver last week but the Bears are actually playing good. Well, decent anyway. The issue? Jay Cutler is still the QB and threw one of the worst interceptions Plonderson has ever seen last week. Tampa Bay/ New York Giants – The Giants make it back in the top 10 in a tie with … what? Tampa Bay!??!? Don’t look now but a big win against the Cowboys last week and an absolute thrashing of the Eagles and here comes Winston and the Bucs! Yep this is a day late but it took that long to get all of the calculations done by Mr. Plonderson and team. After much criticism, we brought in the law firm of Dewey, Cheatum and Howe to audit the findings and also added Larry from Dr. Pepper. Panthers – Well, they just stay at #2 because ain’t nobody has the kahunas to challenge them apparently. Cardinals – That was a statement win by the Cards and Carson Palmer. His old teammates come calling next week. Should be a good one. Seahawks – Despite their loss at the hands of the Cards last week, the Seahawks will get healthy just when it matters and could still be a Super Bowl contender but people are beginning to wonder. Bengals – The Red Rider BB gun. LMFAO. Oh that was good. The Bengals are good but they just aren’t great. Lucky for them that the rest of the NFL isn’t so great either. Packers – This skid is almost as inexplainable as Eddie Lacy’s fall from grace or that some marketing person though Dish Network’s advertisement was a good idea. I truly hate everything about that commercial. Broncos – A rough game for Peyton and the Broncos but this will get better. Life isn’t over in the Mile High but it is possible that Peyton’s career might be. Cowboys – A big fall for the Boys. While it seemed almost impossible for them to find yet another way to lose a game, they beat the odds to be extra creative…. but losing to the Bucs is just inexcusable. This will be the best team to not make the playoffs in NFL history. Vikings – Not sure why Plonderson has the Vikings so low when the rest of the pundits are on the Vik’s bandwagon. The defense is strong, AP is running with authority and Bridgewater does just enough. Falcons/Bears/Raiders – Three way tie for the last spot. Bears impress with big win. Falcons only stay around because of the bye and we just believe that a good Raider team is good for the NFL. Patriots– Injury bugs keep nipping at them but the idea of another undefeated regular season is starting to look like a real reality. Panthers – Say what? A long leap from #5 to #2, but the win against the Pack is a legit win even at home. Bengals – Let’s keep the frenzy at a minimum folks. Yeah, they are good. But last week was against the Browns. It is laughable to see how many Ochocinco jerseys have been seen in public with dust stains on the shoulders. Packers – The likelihood of the Pack busting back up to the top 2-3 is a probability but the last two lackluster performances demand this downgrade. Seahawks – Coming off the bye the ‘hawks are ready to roll into a legit Super Bowl contender. Broncos – A precipitous fall from grace but you just can’t go to Indy and lose to that team. I know emotions where high and they are better than #7 but there has to be a punishment. Cardinals – A week to rest and get ready for the stretch run – the next few weeks will determine if they are an imposter or have some staying power. Raiders – A immeasurably tough tough loss for Raider nation but make no mistake they aren’t going away. This team believes in themselves and they should. They’ve got great offensive skill talent and it’s young. They are building something special. Falcons – Really just because there has to be a #10. Based on the last few weeks, Atlanta would be lucky to be #15. The early wins and some bad luck keep them in the top 10 but they gotta show some real signs of life soon. Patriots– They are just a level above. It’s Belichick’s world and he and only he will determine if you are allowed to live in it. Packers – While a fall further would be merited after a poor performance against the Broncos – the fact remains there is still a chasm in between #2 and #3. Broncos – Shooting up all the way from #7 with a huge home win. How good is this defense? They are ridiculous. And adding Vernon Davis is another boost. Cowboys – They continue to impress with another great effort against the Hawks. Panthers – Just fractionally ahead of the Bengals as they squeak by last night against a motivated Colts team in an absolute mess of playing conditions. Bengals – Even the great Gary Plonderson is subject to peer pressure and this has to be what has happened here. The Bengals continue to prove that Last season the Cowboys pulled off a stunning upset in Seattle. And this year the Hawks travel to big D next week. Could be interesting because these guys are clicking now. Seahawks – They are laying in the weeds about to put together an end of season push. It’s all up to their offensive line. Falcons – Don’t fall asleep on these guys – yes, the score would tell you that they lost to the Bucs however all of the underlying metrics says they should have won and by a lot. Unfortunately for my survivor league, they use the antiquated method of score to determine the winner. Cardinals – A good but just not great team. They need to show some consistency and with the Seahawks and Bengals coming up next after a bye, we will see if they are who we thought they were or not. Raiders – You just gotta love a relevant Raiders team. The NFL with a good Raider team is better than without. But better keep winning, the Vikings and Rams are on your heels. It never ceases to amaze me that when I point out an institution that really shouldn’t exist or has past it’s useful life (see libraries), how outraged people get. Is it just because they adverse to change or could it be that they are just angry at themselves for never realizing how silly said institution is. So, today I take on a bloated, arrogant and outdated establishment called the United States Postal Service. Point #1 – They aren’t really that good at it…. First, the institution is beloved for their creed of “Neither snow nor rain nor heat nor gloom of night stays these couriers from the swift completion of their appointed rounds”. However, this is my first point. While this sounds great, it is far from true… in fact, I’ve had local mail carriers not deliver mail for various reasons including weather. My most annoying response is if there is car parked anywhere seemingly within 10 feet of the mailbox the carrier claims “obstruction” … or if there is a shovel of snow under the mailbox then also “obstruction”. Next, my mail is frequently lost. I’ll never know the amount of mail that I’ve never received but frequently lost items make me realize how bad my local carrier is. At least every other week, I receive a piece of mail that is mis-delivered. Additionally, two items mailed at the same time from several states can arrive days apart. No joke. This happens a lot. I have twin daughters. My mother in NJ sends them cards, they never arrive on the same day… most recently 3 days apart. Absurd. And finally, different location, I’ve witnessed a postal carrier spend 30-60 minutes just socializing with an office receptionist. Daily. Apparently, that’s good management and use of their time? You might say that this is a local poor performing location or specific carrier(s). You might be right but then I’d have to ask why there is no measurement or accountability. Because it doesn’t have to be. See my next point. You guessed it – unions – yep, the same ones who nearly killed the automotive manufacturers in our country control this group. That always means entitlement, taxation-without-representation, political implications and lack of accountability. Even recently, when the idea of suspending Saturday service was introduced (which would have saved a reported 2.2 billion dollars), the unions killed it to keep the artificially bloated salaries of their carriers in tact. The USPS employs over 600,000 workers making it the second largest civilian employer, second only to Walmart. It is also reported that USPS employees make 32% more than what they would if it was a free market employment. No wonder the USPS can’t make any money! The government loves to block perceived monopolies – at least ones that they see as politically advantageous – however, the USPS is protected by government. How so? 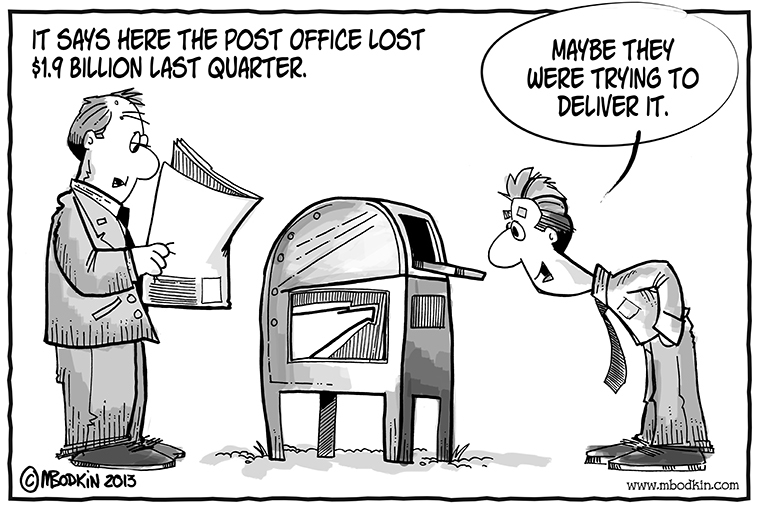 The USPS does not have to pay property taxes – but their overnight competitors who have to pay all taxes and expenses? Of course, they do. 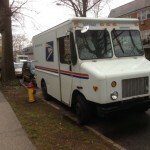 The USPS doesn’t have to pay vehicle registration fees and they are exempt from being ticketed. Bet you didn’t know that!! No parking tickets, no speeding tickets… nothing. It’s like having diplomatic immunity. E-Mail has just about made regular mail obsolete to begin with and I don’t even want to bring up how Christmas/ holiday cards keep them in business. That’s a whole ‘nother rant anyway. Ultimately this bloated and arrogant institution that has served the American public for 24 decades needs to go. At a minimum they should have to compete in a free market economy and remove their monopolistic protections. We all will get better and cheaper service as a result. It’s the American Way! A few tweaks but nothing overly surprising in this week’s NFL Power Rankings are ready for NFL Week 7. I think most people have come around to understanding that these rankings are spot-on and infallible. As always thanks for all the work by Gary Plonderson and always appreciate your thoughtful feedback. Packers – An off-week will do nothing to diminish their dominance. Patriots – It could really have been a major upset with the Jets this week but even if the NYJ had pulled off the stunner, they would still be #2. Cowboys – Dropping one spot due to public pressure and demand but the loss to the Giants with so many miscues just solidifies the power of the Star. Seahawks – Last season the Cowboys pulled off a stunning upset in Seattle. And this year the Hawks travel to big D next week. Could be interesting because these guys are clicking now. Bengals – It’s not always about winning but sometimes it is. Falcons – We are who we thought they are. A hard hard time to figure out but they didn’t do anything to impress with a 10-7 win last week. Cardinals – Stay in the same spot after holding off the Ravens who just can’t seem to catch a break. Jets – Holding at the #10 spot after the near upset last week. After a surprising Week 6 to some the much anticipated (and highly scientific) NFL Power Rankings are ready for NFL Week 7. Again, for those unfamiliar, the algorithm used in these calculations is beyond your comprehension but it is generally regarded as the most comprehensive, exhaustive and all-encompassing rating system known to man and this has been verified by Gary Plonderson. So, point is, just realize that is right. Patriots – they know how to win each week even when it requires a complete blunder by their emotionally charged opponent. Panthers – the biggest mover of the week with a huge win against Seattle. Seahawks – don’t doubt their record and high rating… schedule is tough but they will be there when this shakes out. Bengals – Why so low some may ask? Their confidence is building but their luck of other team’s timely injuries is fortuitous. Falcons – We are who we thought they are. Actually they got the reverse Bengal treatment. They are probably a little higher than this ranking despite stb against the Saints. Cardinals – Lackluster effort against Pittsburgh makes them a big drop in the rankings this week. Jets – First appearance – Chris Ivory is an unsung top NFL RB. Take note. Argue if you’d like but this is on point. After the conclusion of Week #5 in the NFL here are the much anticipated G-Squared Power Rankings. The secret formula, which will remain unpublished under the watchful eye of the master statistician Gary Plonderson, will be criticized often but is widely regarded as the most accurate and fully insightful metric known to mankind. So here’s the logic in several key points from a football standpoint. When I read the book “Moneyball”, it really made me look at everything twice. What other conventional wisdoms, really weren’t wise? What about football? Maybe going for two more frequent or on-sides kicks? Hmmm…. wait…. 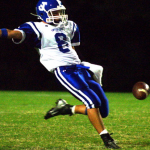 what about punting? Of 120 Division I FBS schools, 75 teams rated 50% or better on their 4th down conversion attempts in 2012. The three schools who attempted to move the chains on 4th down the most? Army, Georgia Tech and LA-Monroe all attempted it more than 3 times per game and were successful 51%, 64% and 69% of the time respectively. Take it one step further and only two teams out of those 120 were below 25% success and one of those teams was Coach Pasqualoni’s UConn squad, which is more of a indictment on poor coaching than the strategy of going for it on 4th down. Now I understand that most of these teams choose to go for it on 4th down because it is short yardage or other advantageous reasons, like field position, but what does that say about the times where it is 4th and 1 and the punter runs out there? 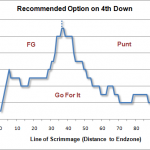 In researchng this blog post, I came across a 4th down study that goes further indepth into the numbers and as a result produces this chart for coaches to follow. In fact this article from Advanced NFL Stats is tremendous and goes way further in depth than most of you looking for an entertaining argument would like, but for those who are interested: Here it is. Knowing how coaches need an article, a headset and an assistant to figure out whether to go for one or two, I figure this chart should be very handy on the sidelines. Doesn’t it drive you crazy when a team scores on their first possession in the first quarter, lead 6-0 and the coach holds up a one finger… you know, just in case anyone was thinking he might want to go for two? This leads me to my next question: Why don’t more coaches do what Kevin Kelley did or even more like Georgia Tech? Why don’t they go for it? Simply put: They are sheep. Stupid stupid sheep. They are being led to the slaughter but the coaches are afraid of getting to the slaughter too quickly so they decide to play it conservative. Don’t challenge anything… just keep playing by the same rules, ideals and philosophies of yesteryear. They are doing what the scouts did in Moneyball and the coach who rethinks this first will be a genius. That is if the fans and press let him enough rope to be successful with it. Think of some of the other advantages: Extra roster spot that was used for the punter, no more punting practices, instead that valuable time can be used for regular game situations and you keep the other team on their heels. Just like in Moneyball, if you give up outs, you give up runs. When you give up the ball on 4th down in football, you give the other team the opportunity. Want one more reason: When the team you root for stops an opponent on 3rd down, you are so happy to be getting the ball, right? In fact, if the opposing team lines up to go for it on 4th down, you get nervous and upset… you want them to punt. Which is just one more reason why you shouldn’t… your opponent wants you to. Stop the madness. Stop punting.